There are thousands of Ascended Masters currently supporting the Earth and those of us who live here. They are Beings of Light who have learned the lessons of our Third Dimensional existence and have ascended to a higher state of consciousness. Giving assistance to all who call to them for help, they are our “elder” brothers and sisters. Some famous Ascended Masters are Jesus (Jeshua) Christ, Gautama Buddha and Krishna. Saint Germain is an Ascended Master who has long been associated with the Violet Flame. You can call on his assistance as you practice Violet Flame Meditation. Along with many other Ascended Masters, he has been preparing us to transition from the Age of Pisces (Third Dimension) to the Age of Aquarius (Fifth Dimension), beginning an era of peace, freedom and enlightenment. 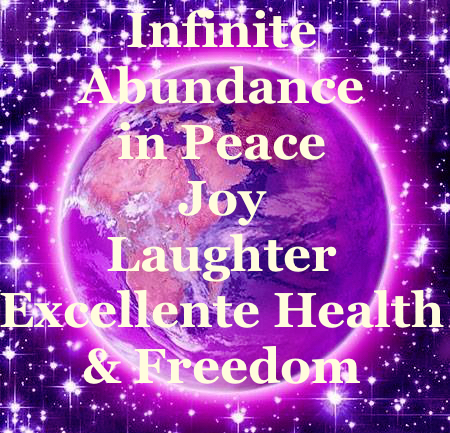 With Violet Flame Meditation you can consciously access powerful Fifth Dimensional frequencies that dissolve lifetimes of unresolved, unhealed energies with love and light. This is crucial to each of us as individuals and for humanity as a whole, especially at this specific time on our planet. The distillation of all experiences we’ve ever had in any lifetime or dimension is still in our individual and group energy field, both positive and negative. Until the dense negativity is transmuted into love and light, we, both as individuals and as a race, suffer from the resulting chaos and negativity that we’ve experienced for eons on this planet. Violet Flame Meditation can help us do that. The power of Violet Flame Meditation comes from the Fifth Dimension, which resonates with unity consciousness, transcending the ego-based ideas of separation we have lived in the Third Dimension for eons. We are free of the illusion of time and space as fixed realities. They are perceived as the fluidity that they truly are. From a Fifth Dimensional perspective, we are always in the present Now. There are still cycles of being, but they have no real power over the creative potential of the present moment. We recognize that where we place our attention in the present moment is what creates our essential experience. What we focus on we begin to resonate with. Our focus literally creates our perception of ourselves, as well as how we experience the world. This is the key to conscious creation: Whatever we focus our attention on manifests in our lives. Space and distance are also seen as illusions. In the Fifth Dimension we are always connected to those we love, no matter where they “are.” Furthermore, we will see that we are all energetically connected as human beings and that the Earth we live on is a co-creation of our group consciousness, including animals and non-sentient life. In the Fifth Dimension we move forward in our lives through our passion, by naturally choosing that which brings us the most joy at every choice point. By connecting with our passion we expand outward and open our consciousness to higher energies. Following the path that brings us the most joy unfolds us into the conscious awareness of the true essence of who we are. The extent to which we hold on to old structures and concepts of separation correlates directly to the extent of the fear, anxiety and stress that we feel. As we open into expanded awareness, uplifting energies continue to pour into this plane at an accelerating level. These energies bring to the surface all that is within us of a lower vibration that needs to be healed, giving us the opportunity to see what we’ve been holding on to that no longer serves us so that we can let it go. Because of this exposure of the negativity for healing, it can look like things are getting much worse on our planet and in our individual lives. However, this is far from the case. We are actually in the midst of a group awakening into the Oneness we already are with our Creator. Violet Flame Meditation can greatly assist us in making the transition from a fear-based life to a Unity-based life. No matter how intense things look in our lives and/or in our world, we need to keep using the White Light, Violet Flame of Love, and The Miracle of Forgiveness Healing to release old concepts and beliefs that obscure the light. Whenever we invoke the light in our own lives, the light and wellbeing of the entire planet and human race expands. No matter how far we think we’ve turned from the light, once we turn our attention back to it and choose love and forgiveness, we are enfolded in its healing embrace. We can do this merely by focusing on upliftment – on whatever brings us a feeling of relief, love, and expansion. These feelings tell us we are on the right path. Whatever energy (emotions, thoughts, etc.) we think we are sending to another person, place or thing we experience ourselves. The energy seems to travel in a circle, always back to the source from which it came. However, in actuality, we are all One Being, so whatever energy I think I’m sending to “you” is still “me” so I feel it. This principle is demonstrated by The Golden Rule, “Do unto others as you would have them do unto you.” How we “do unto others” is literally what we are doing unto ourselves. This principle is also known as “karma,” “cause and effect,” etc. Basically, the energy of any thought, word, deed or action we’ve ever emitted in any lifetime or dimension, whether positive or negative, we ourselves feel. Also, by the Law of Attraction, if we feel these negative energies (the ones we originally thought we sent out to “someone else”) coming at us and then react negatively again, we keep attracting more of the same negativity to ourselves. As we vibrate (negatively or positively), we create. With Violet Flame Meditation we can release negative energy from thousands of lifetimes back into the pure positive God essence that is at the core of who we actually are. Anything unresolved within our energy field will keep manifesting itself in our physical / mental / emotional / spiritual life until we heal it. There is no escaping this. When we understand that life is presenting us with an opportunity to heal something within us it becomes easier. When negative experiences occur, if we can acknowledge, accept and decline to resist what is happening as well as the feelings evoked, we can then bring love, compassion, understanding and forgiveness to ourselves, as well as to other people involved and the situation itself. In this way we can heal the wounded aspects within us so that we won’t have to keep going through the same painful scenarios again and again. Violet Flame Meditation can help us to bring love, forgiveness, healing and release to all of these painful feelings. The pure Divine Feminine ray of energy (relating to our right brain and heart) is crystalline pink, with the qualities of pure unconditional Divine Love, nurturance and compassion, and adoration and reverence for all life. The pure Divine Masculine ray of energy (relating to our left brain, throat and heart) is sapphire blue, and relates to the desire, inner resolve, power and will to follow Source’s Divine Will. It also carries our ability to have leadership over ourselves. When the Divine Feminine and Divine Masculine rays of energy are merged and balanced within us, our higher centers and Christ Consciousness – which is the gold ray of energy – is awakened. The Gold Flame embodies wisdom, discrimination, and illumination. When all three of these flames are balanced within us, love balances power and wisdom blends with love, and the Violet Flame of forgiveness and transmutation is activated within us. At the core of every single electron of energy, even a negatively charged electron, is the divine aspect of pure being. When the Violet Flame is consciously blazed through any electron of energy, it awakens the pure spark of divinity within it, which then burns up the outer negativity and transmutes that electron back to its original state of pure love. During Violet Flame Meditation, I experience the Violet Flame as infinite Love, forgiveness, tenderness and freedom. When we call it forth with the intention of forgiveness and healing, it bursts as a flame within our hearts. When we consciously direct it into a situation, it blazes through it with a loving force so undeniable that everything in its path has no choice but to resonate with its love. The Violet Flame permeates every cell and atom of our bodies, minds, emotions, memory, subconscious and spirit. It transmutes anything negative that is lodged anywhere in our spiritual or physical being, raising it to a high vibration of love and light. Negative thoughts and feelings create an excess of acid within the body that is too much for our bodies to detoxify. This causes the breakdown of our physical energy systems, dis-ease and illness. The Violet Flame can help heal our bodies on a physical level by removing the negative energy that creates the acidic conditions. It goes to work on the deeper causes on the mental, emotional, causal, and psychic levels. On the atomic level, vibration is the speed at which electrons orbit around the nucleus of the atom. In form, Violet Flame Meditation actually changes the vibratory rate of the body, working on the atomic level. When the atoms of our bodies are imbued with negativity, we vibrate slower, at a lower vibration, which causes us to resonate with MORE negativity and actually attract it. Our bodies and minds become more dense and coarse, with less light shining within. With Violet Flame Meditation we can transmute this negativity. When we invoke it with forgiveness in our hearts, for ourselves and others, it raises the frequency of the negativity into a vibration of love and wellbeing. It literally transforms whatever is out of alignment with wellbeing back into the light that is at the source of every atom. Consequently, in Violet Flame Meditation the vibration of our entire energy field in form is raised to a higher level, and we are more aware of ourselves as Spirit, light and love, resonating with optimum health and wellbeing. A really wonderful thing to be aware of is that you don’t have to fully understand the nature of Violet Flame Meditation or how it works for it to work! It isn’t possible for our minds to encompass what lies beyond the parameters of the mind. You can ask your I AM Presence (yourself from your highest perspective) to take command, and then simply invoke the Violet Flame as described below. In experimenting with Violet Flame Meditation, I’ve found that I significantly increase its healing effects if I can call up the intention of forgiveness in my heart first, before invoking the Violet Flame. Even if I’m not feeling particularly forgiving, but I’m WILLING to feel it for myself, other people involved, or a situation, this opens my heart and increases the power of the Violet Flame to do its transformative work. To increase the effectiveness of Violet Flame Meditation, or ANY healing, it is helpful to first open our heart chakra, the seat of the Divine Feminine within our being (whether we are currently embodied as male or female). The heart chakra is where ALL emotions are felt. Because of the pain we’ve experienced from our lives in the dimensions of form, we as a race have shut down our heart centers in an attempt to not feel the pain. Therefore, our connection with Divine Feminine energy and unconditional love and forgiveness has been narrowed down and the misuse of masculine power (by both men and women) has taken precedence on our planet and in our lives. To heal and open our heart chakras, we need to go into our hearts and acknowledge the pain there, bring love and compassion to our own wounds, and turn them over to The Divine to heal them. Then we can begin finding the balance between our masculine / feminine aspects, and bring love and forgiveness to others. You can call on Divine Feminine / Divine Mother energy to assist you in healing your heart center and bringing more love into it. Envisioning pink light all around and permeating your body, especially around your heart center, can help a great deal. Everything is energy, vibrating at different speeds. Negative thoughts, words, feelings and actions vibrate at the denser end of the energy spectrum, while the positive thoughts, words, feelings and actions vibrate at the higher, more uplifted end of the spectrum, closer to the original God Source. Use Violet Flame Meditation (see below) to transmute all of the energies of our past thoughts, words, feelings and actions back into the original vibration of Love from Source. Pay attention to our current thoughts and feelings so that we don’t set ourselves up to receive more of our own negativity. When we become aware that we’re following a negative train of thought, we can choose a different thought instead – one that brings a feeling of relief and expansion. Once 51% of the energy we are emitting is of a positive nature, we achieve a “tipping point” where ALL energies within us are transmuted into the positive spectrum. And we never know when that 51% tipping point can occur. This is a “critical mass” where an unstoppable shift occurs. It is a natural law of the Universe. And with Violet Flame Meditation we can do this! It is important to keep the tipping point of transmutation in mind when we are going through a “growth period” and are tempted to wallow in negativity. Growth periods are times of chaos when it feels like the whole world is against us and we have lost sight of wellbeing. I’m sure you know what I’m talking about. These are periods when our wounded aspects are being brought to the surface for healing. Each of these periods are a window of opportunity to heal something that has been wreaking havoc in your life, maybe for many lifetimes. This is a good time to focus on the light with even MORE tenacity. Knowing that by keeping our attention on light and love when we feel challenged, we will eventually reach the critical mass of positive energy that can transmute all the negativity of that situation to positive energy. We just need to keep working with uplifting tools such as Violet Flame Meditation and the positive principles we know to be true, to keep our attention focused in a positive direction. What is it that I DO want in this situation? Am I adding to the light of the planet or to the shadow? This tipping point isn’t just applicable to us as individuals. It applies to ALL beings on this planet, and the planet itself. When there are enough of us focusing on the light so that our group consciousness is vibrating at 51% in the light, then an unstoppable shift into a higher vibration can occur for the entire planet! I believe this “tipping point” is the same as what I described earlier: our ascension as a race and as a planet, from the Third Dimension of egoic separation to the Fifth Dimension of unity consciousness. And it is entirely within our power to do this. Violet Flame Meditation is a powerful tool to make it happen. The most effective use of the Violet Flame that I have found is through a combination of meditation and “decrees” – spoken (silently or aloud) prayers that use visualization / imagination while being in a meditative state. 1. Sit in a quiet place where you won’t be disturbed. Sit comfortably with your spine straight and your arms and legs uncrossed. Place your feet flat on the floor. You can rest your hands on your legs, palms up. 2. Breathe in love and / or white light through your heart center. Do this several times until you can FEEL it. This method is most effective when you feel devoted to love and forgiveness. If you can’t quite get there, just keep breathing in love and/or white light until you begin to feel a softening and opening within. Envisioning a soft, unconditionally loving, pink crystalline light around and through you can help open your heart as well. 3. To begin Violet Flame Meditation you can start with something simple like, “I AM a Violet Flame of love and forgiveness.” Slowly repeat this several times out loud, and tune into your feelings and perceptions. It is much more powerful to speak out loud than silently. Remember to keep a loving, forgiving perspective (or be willing to have that perspective) and a sincere desire to heal. If you wish, you can keep repeating this simple phrase over and over again, even hundreds of times. Repeating a decree draws in more light. Speaking from your I AM Presence is the most powerfully creative perspective you can center yourself in. It is where you are One with Creator. While slowly repeating your decree, notice if you feel more loving and spacious. Experiment with different words to see if they evoke more healing energy or less. Go with what brings you relief, feels fun, softens your perspective and is inspiring. Another component of Violet Flame Meditation is the use of visualization and imagination, which are “view ways” into other realms. Anything we can visualize is real somewhere within the vast realms of form. The more frequently that we return to a visualization, to that same extent it manifests energetically in our human lives – physically, mentally, emotionally. As you speak your decrees during Violet Flame Meditation, picture a huge bonfire of Violet Flames, wide enough and high enough to encompass your body and extend three or more feet above your head and all around your body. Within the flames see different shades of blue, pink, gold and purple colors. See these Violet Flames all around you and permeating your body. Feel into the places within your being (physically, mentally and emotionally) where you need love, and see the Violet Flame touching and permeating all of them with love and transmuting them into light, love and forgiveness. That’s all you have to do. You don’t even have to be specific about what to heal. The Violet Flame knows exactly where to go within their being and what to do. The key part is to feel your intention of love and forgiveness for them and to visualize them within the Violet Flame. As I mentioned above, I highly recommend formulating short decrees in order to focus the energy of the Violet Flame on specific areas. However, it is also very useful to use a comprehensive decree to do ongoing, multi-level Violet Flame Meditation targeting facets of ourselves that we aren’t even aware of, but are still affecting us negatively. Doing this regularly can steadily unwind whatever negative karmic energies we have accrued. A good time to do Violet Flame Meditation is first thing in the morning, or last thing before sleep. As mentioned before, sit in a quiet place where you won’t be disturbed, with your spine straight and arms and legs uncrossed. Breathe in love and/or pink or white light through your heart center until you can feel a softening and opening within. You can use the following as your decree or formulate one that you resonate with the most. I find it comforting and balancing to bring gold light in at the end of Violet Flame Meditation. Pure gold light is a manifestation of Christ Light. It fills your being with peace and illumination. It deeply nurtures your energy field on all levels, for balance and completion after any kind of energy healing. After doing a Violet Flame Meditation, your heart is open and you are in a powerfully creative vibration. This is an excellent time to envision what you DO want in your life, now that the Violet Flame is at work transmuting what you’ve released. Experiment with different visions to find one that brings more light, love, and joy into your being as you view it. Then keep expanding and adding to that vision, testing to see if each thing you add brings more relief and joy. If it doesn’t then let it go and experiment with something else until you find something that does. Whenever you focus on something for 17 seconds or more, by the Law of Attraction, the energy expands exponentially, and you begin to draw the manifestation of your vision to yourself.